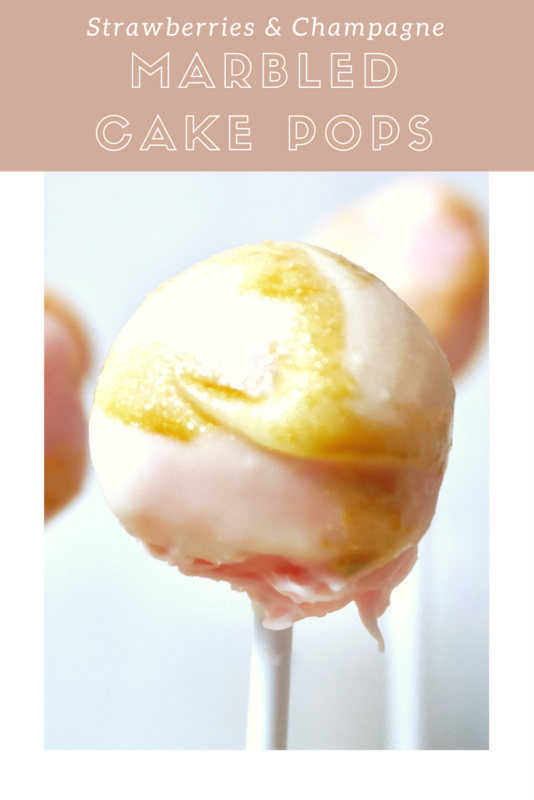 Have you ever made cake pops? My attempt at Strawberries and Champagne Cake Pops was my first ever attempt at cake pops. While the feedback on these was fantastic, I am absolutely never making them again. I had no earthly idea how complicated and long of a process cake pops can be! Unless you are skilled at working with candy melts, you may feel my pain of battling the mystery that is candy coating. 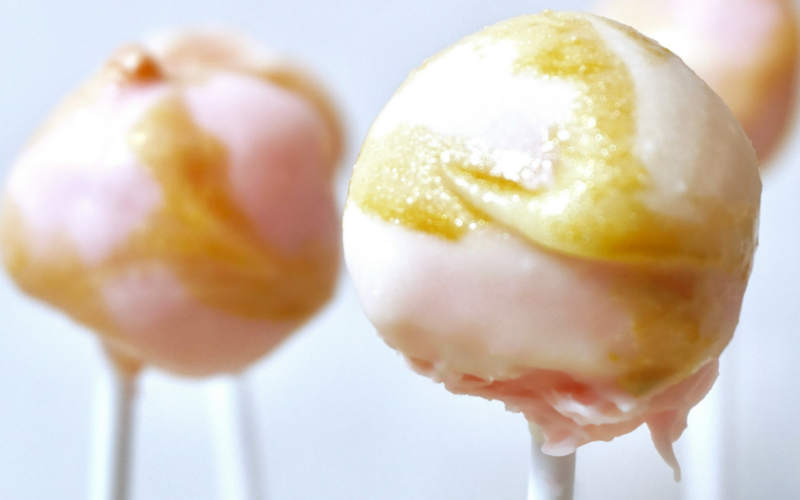 If you are a seasoned cake pop pro, you are a unicorn in my book! Please share any tips you have in the comments. I made these for New Years as a compliment to champagne (and a midnight snack! ), but they would make a great Valentine’s Day Cake Pop Bouquet. On a side note, working with Wilton Pearl Dust was so much fun! I ordered mine on Amazon a while back (you can find different colors here) but you may be able to find it at Michael’s as well. The pearl dust turned out great and worked way better than Wilton sprays. The recommended extract to use is lemon extract but I cannot bear lemon so I used vanilla extract to mix it with. The combination created a very thin and runny texture so be sure to really tap the brush on a bowl so your design doesn’t run. 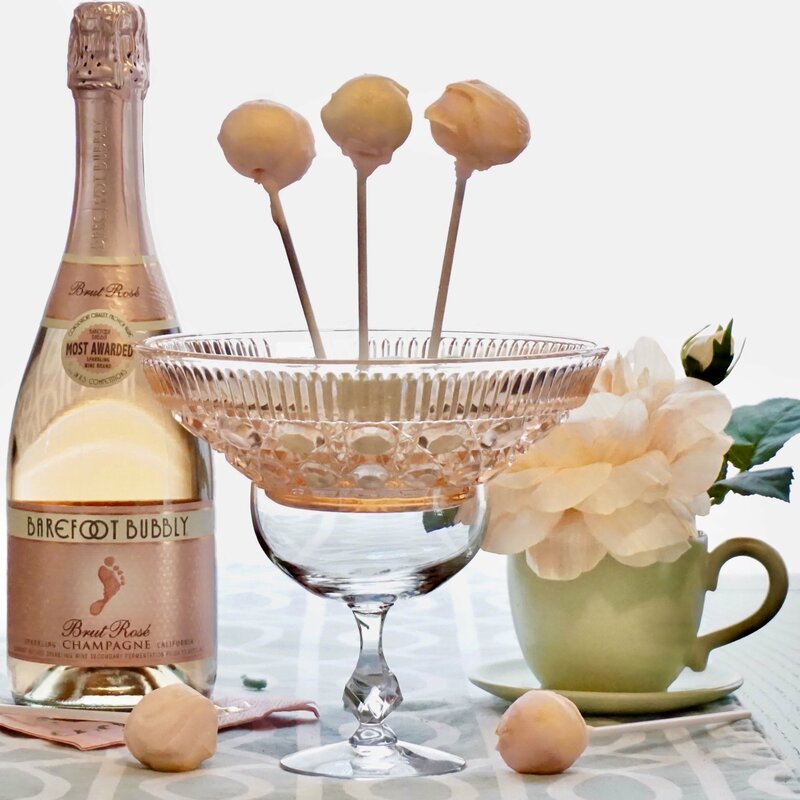 Strawberries and champagne cake pops are perfect for New Years, Valentine's Day or any romantic occasion. Follow the cake instructions according to the box but also add 1 1/4 cup of champagne to the cake batter. Bake according to package directions. Keep in mind that champagne has been added so the cake may take longer to bake (mine took almost 30 minutes for a 9x13). Remove the cake from the oven and let the cake cool, then slice into small squares. I waited around one hour for my cake to cool. Crumble the cake into a large bowl or stand mixer bowl with a whisk attachment. Add icing to the cake crumbles and mix with a whisk attachment on a stand mixer until mixed thoroughly. Place bowl in the refrigerator overnight OR in the freezer for 2 hours. Line a cookie sheet with wax paper. Form small round balls by rolling quickly in hands and place on cookie sheet. Once the balls are finished, place the cookie sheet(s) in the refrigerator for at least two hours (the freezer works better if you have room!). Melt the candy melts in a microwave-safe bowl in 30-second intervals, stirring between each, until smooth. Stir in the vegetable oil (start small with the vegetable oil but you will likely have to add more than 2 tablespoons). Remove the cake balls from the refrigerator or freezer. Dip into the melted candy with a spoon or a fork then transfer back to the cookie sheet. 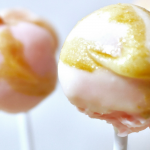 NOTE: If you are putting the cake pops on a stick, dip 1/4 inch of the stick into the candy melt mix then place about halfway through cake pop. Dip cake pop into the candy melt mix to coat, then transfer to cookie sheet. Mix the pearl dust and extract (I used vanilla) in a small bowl and paint the balls. Since my candy did not coat evenly, I just painted the flaws with the pearl dust and had a blast! I just washed an unused paint brush since I did not have a brush specifically for food. These dry fairly quickly but be sure they are dried completely before storing. I had to make two batches of pearl dust mix because one was not enough for my preference. Transfer cake pops back to freezer and/or refrigerator to store until ready to eat. I kept mine chilled the entire time until ready to eat. Use vegetable oil to thin out the candy melts. The recipe calls for 2 tablespoons but you may need a tad more. Just add slowly because once you add too much, you cannot turn back. If you are making these for an event, make a few days in advance. Cake pops take a long time to make due to all of the cooling, so allow enough time before you need them. Grab an extra bag of candy melts if you budget allows for it. This allows room for error (I had to toss one batch!). If you want sprinkles in your pops, dip the cake pops into a bowl of sprinkles right after dipping them in the candy melts. Once the coating is dry, the sprinkles won’t stick.